White City is a small area in west london created as an exhibition site in 1908, morphing over the years into an Olympic games venue, a greyhound track, the home nearby of the BBC (British Broadcasting Corporation) and most recently the new western campus for Imperial College London.♣ The first Imperial department to move into the MSRH (Molecular Sciences Research Hub) building is chemistry. As a personal celebration of this occasion, I here dedicate three transition states located during my first week of occupancy there, naming them the White City trio following earlier inspiration by a string trio and their own instruments. The conformation of carboxylic acids revealed. Following my conformational exploration of enols, here is one about a much more common molecule, a carboxylic acid. I’ve started so I’ll finish. Kinetic isotope effect models for a general acid as a catalyst in the protiodecarboxylation of indoles. Earlier I explored models for the heteroaromatic electrophilic protiodecarboxylation of an 3-substituted indole, focusing on the role of water as the proton transfer and delivery agent. Next, came models for both water and the general base catalysed ionization of indolinones. Here I explore general acid catalysis by evaluating the properties of two possible models for decarboxylation of 3-indole carboxylic acid, one involving proton transfer (PT) from neutral water in the presence of covalent un-ionized HCl (1) and one with PT from a protonated water resulting from ionised HCl (2). 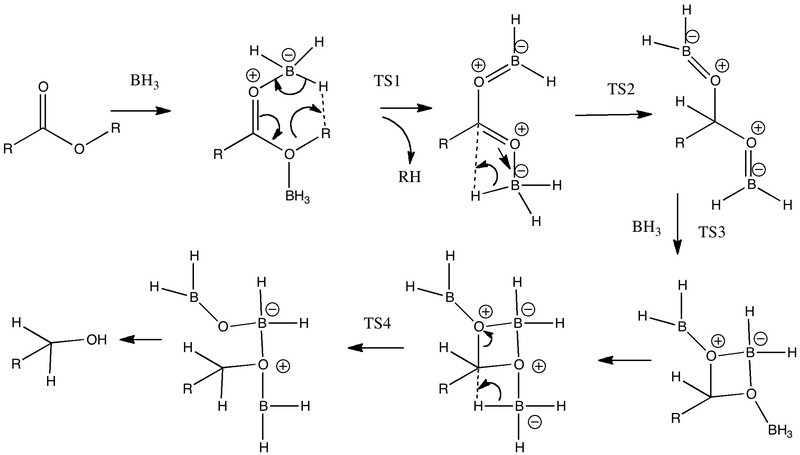 Mechanism of the reduction of a carboxylic acid by borane: revisited and revised. I asked a while back whether blogs could be considered a serious form of scholarly scientific communication (and so has Peter Murray-Rust more recently). A case for doing so might be my post of about a year ago, addressing why borane reduces a carboxylic acid, but not its ester, where I suggested a possible mechanism. Well, colleagues have raised some interesting questions, both on the blog itself and more silently by email to me. As a result, I have tried to address some of these questions, and accordingly my original scheme needs some revision! This sort of iterative process of getting to the truth with the help of the community (a kind of crowd-sourced chemistry) is where I feel blogs do have a genuine role to play. Anatomy of an asymmetric reaction. The Strecker synthesis, part 2. In the first part of the post on this topic, I described how an asymmetric sulfoxide could be prepared as a pure enantiomer using a chiral oxygen transfer reagent. In the second part, we now need to deliver a different group, cyano, to a specific face of the previously prepared sulfoxide-imine. The sulfoxide is now acting as a chiral auxilliary, and helps direct the delivery of the cyanide group to specifically one face of the imine rather than the other. After removal of the aluminum carrier for the cyano group and hydrolysis of the cyano group to a carboxylic acid group, we end up with an enantiomerically pure amino acid.